A painting dropped off at Goodwill [in Portland, OR] by an anonymous donor sold for $165,002 Thursday during an auction on the organization’s Web site. 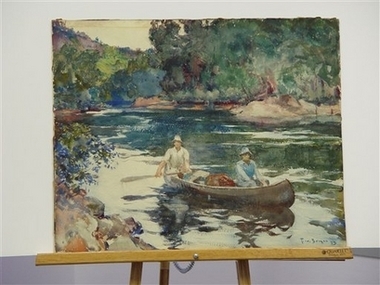 Bidding on the painting, a 1923 watercolor by the American impressionist Frank Weston Benson, started at $10 on Oct. 12. The bidding soared after the painting was authenticated by the owner of a Portland gallery. The name of the winning bidder has not been revealed. Dale Emanuel, spokeswoman for Goodwill Industries of the Columbia-Willamette, said that the nonprofit gets a lot of valuable donations, but that it’s unknown whether the person who dropped off the painting knew its worth. Bathed in the orange glow of illuminated “Jack-o’-lanterns,” Boston smashed a world record on Saturday when thousands of volunteers lit the largest number of Halloween pumpkins ever assembled in one place. Keene, New Hampshire, a city northwest of Boston, has held the record with 28,952 lighted pumpkins since 2003 and vowed to defend its title by illuminating 30,000 this year. The final total of lit pumpkins in Boston was 30,128. Keene, NH, has vowed to surpass that at their festival. Stay tuned. A Wisconsin man visiting an [Arkansas] state park took home the ultimate souvenir: a 5.47-carat canary diamond. Bob Wehle of Ripon, Wis., found the diamond at the Crater of Diamonds State Park in Murfreesboro Oct. 14. The park is the world’s only publicly operated diamond site where visitors are allowed to search and keep any gems they find. 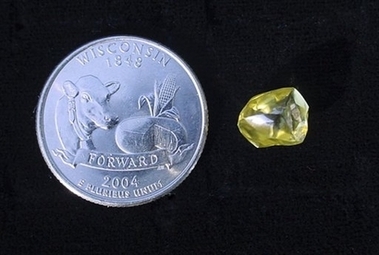 Wehle’s 5.47-carat diamond is bright yellow and has no visible flaws, said Tom Stolarz, park superintendent. It is the second-largest gem unearthed this year at the park. “At first glance, it makes you think of lemon drop candy,” Stolarz said. The largest diamond this year was found by a Texas couple. Donald and Brenda Roden of Point, Texas, found a 6.35-carat brown diamond in September. The stone is shown next to a quarter. A 59-YEAR-old German man who has spent the last 34 years in jail has turned down offers to be let out. The man, identified only as Gerold H, was convicted of murder and sentenced to life imprisonment in 1972 when the area was part of communist East Germany. German prisoners have no obligation to agree to leave jail before their sentences have been completed.